Hello, Amigos ! Here’s the good news for the devotee of sports bike in our country, Kawasaki demonstrates their next moves in the automobile industry. The Japanese automaker reveals the all time favourite sportsbike called to be Ninja is coming once again with all new looks and lighter body. Kawasaki unveiled the all new Kawasaki Ninja 400 at the Tokyo Motor Show. And It’s finally launched in the indian market at Rs 4.69 lakh (ex – showroom, Delhi). 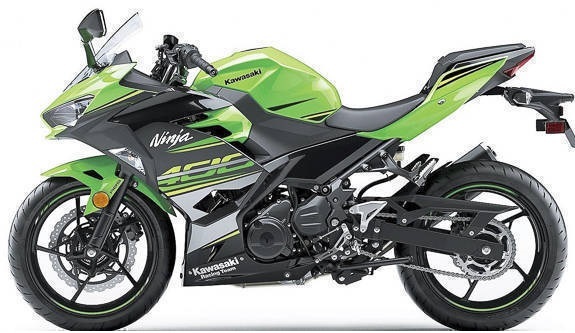 If we overall look on the features in the 400cc machine, the first thought anyone can get is, bike looks aggressive and attractive to get an eye on , it gives the trademark of Kawasaki Racing Team colours. Commenting on the output, Ninja 400 is a new 399cc parallel-twin engine which gives an output of 44.8bhp, as if we compare it to the predecessor Ninja 300 it’s up from 39bhp and 38Nm of torque. Comes with an lighter body weight . The new Kawasaki Ninja 400 is equipped with, slipper clutch, 41mm Kayaba forks upfront, Nissin ABS unit, digital instrument cluster and many more. Bike is available in 3 stunning colors – Metallic spark black, Ebony KRT edition and Lime Green.